We tend to associate mummies with ancient Egypt, but a lot of culture around the world practiced mummification. The Anga tribe of the Aseki region of Papua New Guinea is one of them. Anga’s mummies, however, aren't wrapped in bandages and placed in tombs. They are left in the open, high above a cliff, often overlooking the village where they once lived. 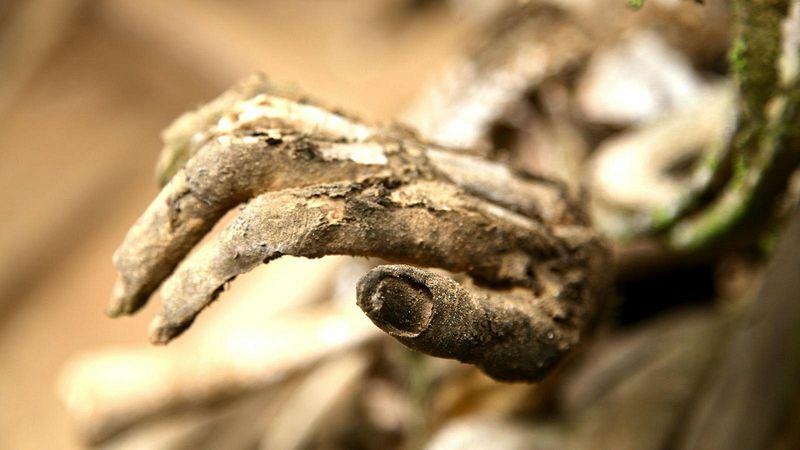 One of the most important process of mummification is the removal of moisture from the dead bodies, because water promotes decomposition, and a decomposed body cannot be preserved by mummification. Ancient Egyptians achieved this by covering the dead bodies with salt and mixture of spices that had great drying properties. 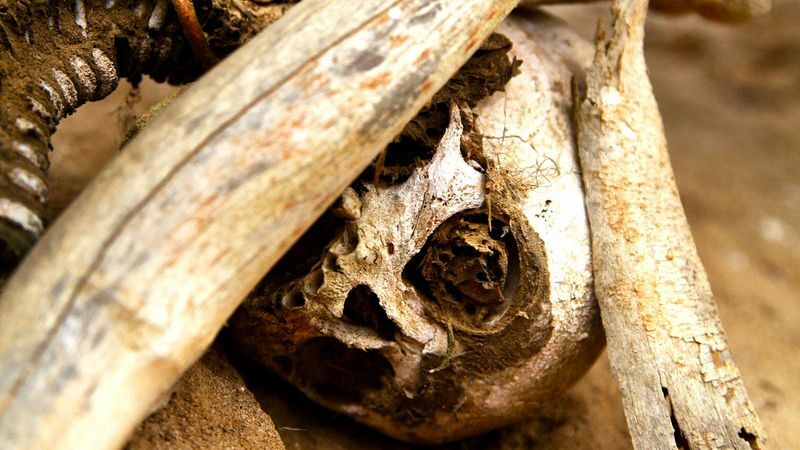 The Anga tribe employed a more direct approach — they heated the dead bodies over a fire. The elaborate process began by slicing open the knees, elbows, feet, and other joints. Hollow bamboo poles were then inserted in the slits, as well as the stomach of the body to evacuate its contents. The bodies were then smoked for over a month until all bodily fluids had dripped out of the numerous cuts made in the body, as well as through the bamboo tubes. This fluid was collected and massaged by the villagers over their own bodies, as a mean to transfer the power of the deceased to the living. Some articles claim that the left over fluid was used as cooking oil, which is not only gross and revolting but is also a lie. Most of what’s known about the mummies is based on the exaggerated tales of one British explorer named Charles Higginson, who was the first person to document a report on the smoked corpses in 1907. It was Charles Higginson who described the Anga as bloodthirsty savages who greedily lapped up the entrails of their own kin during the smoking process. “But if that was the case,” reasons Ian Lloyd Neubauer, who travelled to this part of Papua New Guinea and spoke to the people there, “then why didn't the Anga make a meal of Higginson, a lone and defenceless foreigner living in their midst?”. 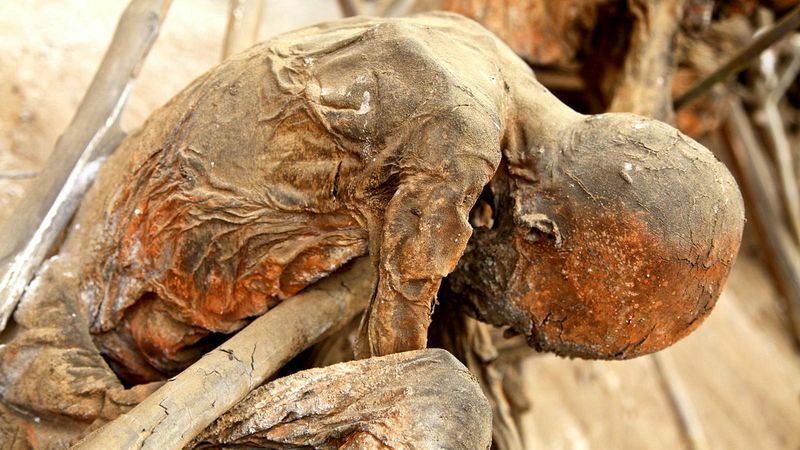 After the body was smoked and dried, it was covered with ocher, a claylike form of iron oxide, to protect the mummifying remains from scavengers and the elements. 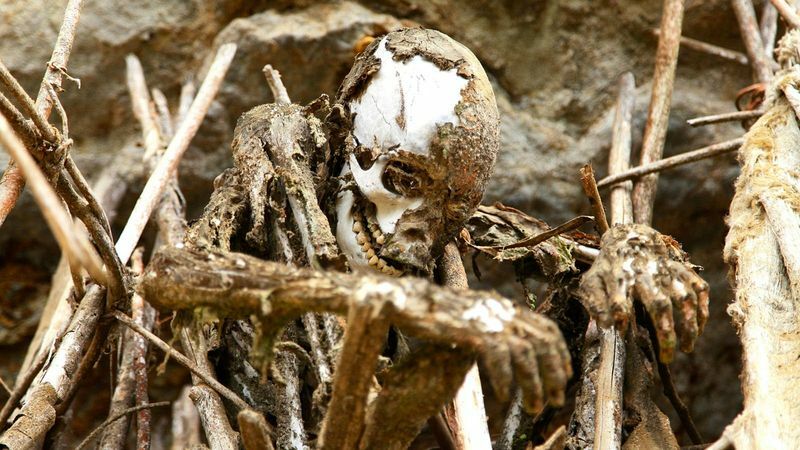 Even in the sweltering conditions of Papua New Guinea, which normally accelerate the decomposition of corpses, the process worked remarkably well. 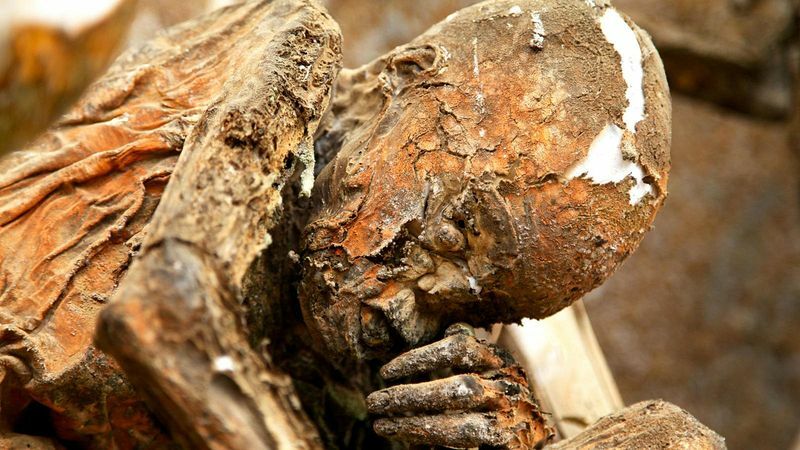 Mummification came to an end in 1949 when missionaries took firm root in Aseki. 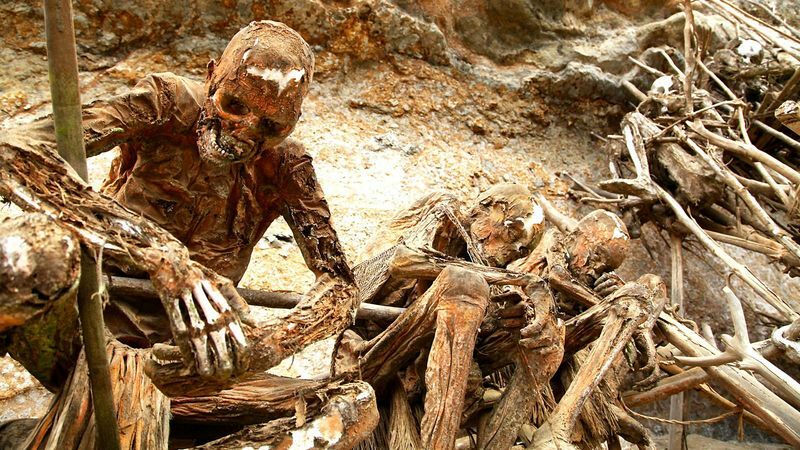 The remaining mummies are now carefully preserved by villagers who periodically perform restoration work whenever a limb of a mummy droops or looks like it would fall off. Supports to body parts would be added, and heated sap from local trees would be used as glue. They would also touch up the ocher clay. 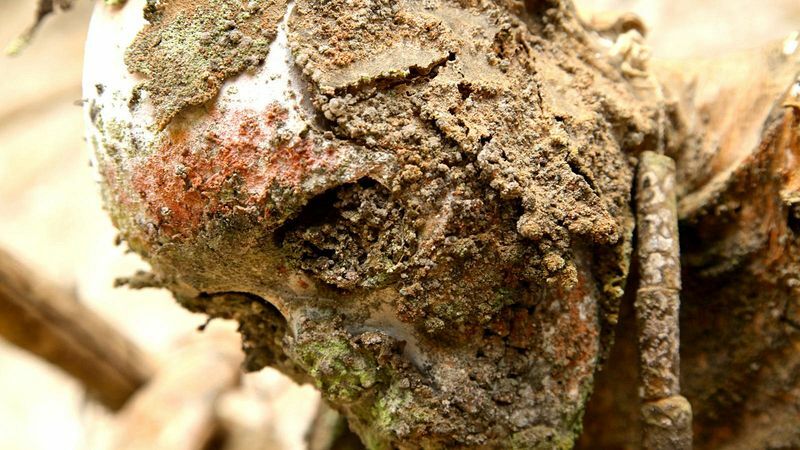 Anga mummies can be found in several villages of Papua New Guinea's Aseki District. Incidentally, the Anga tribes weren’t the only people who smoked their dead. 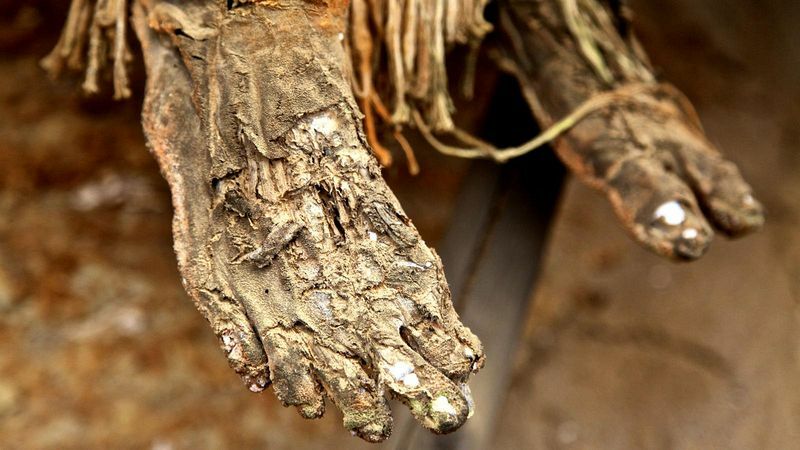 This type of mummification was also practiced by the Philippians in the town of Kabayan. 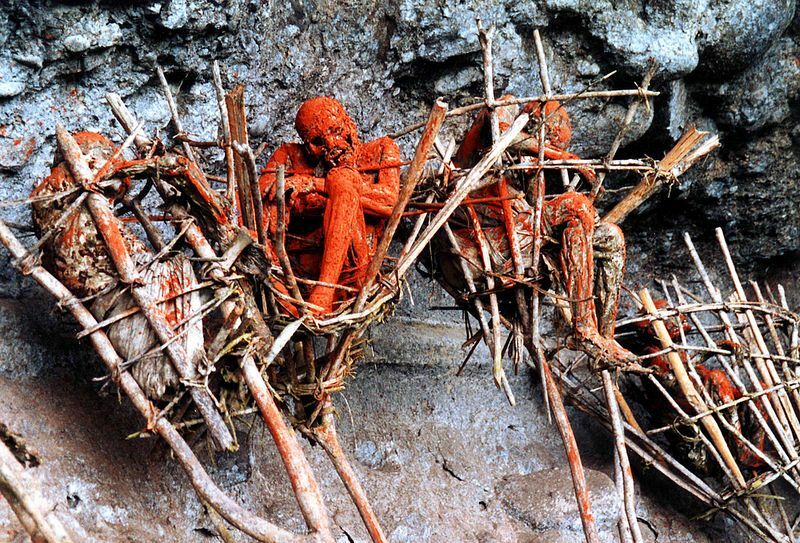 They are known as Kabayan Mummies or Fire Mummies.